When you first think of a hospital and all the equipment necessary to make a hospital run efficiently, you might not initially think of headphones in the hospital. We understand that the latest technology in medical equipment is the most important for doctors and nurses. That is something most people can agree on. However, upon further consideration there is also a great need for headphones in hospitals. One example is for patients and visiting family that can sometimes spend an exorbitant amount of time waiting for updates, news, results and recovery. This creates quite a bit of down time and a need for activities to do that will help pass the time. This can include using mobile devices such as smart phones, tablets and music players. The challenge is that not everyone remembers to bring or has time to consider their headphones. If you walk through any hospital waiting room, there is always a number of people mobile devices. In some cases, and depending on the situation, they did not plan to be at the hospital. Even if they had a scheduled appointment, they may have been too busy to consider bringing headphones to the hospital. They were likely focused on other more important things. On the other hand, if you are a visitor going to see someone special at the hospital, recovering from a procedure, you will likely still spend time waiting to see them. In addition, after visiting hours have come to an end, the main choices for passing the time are books or a TV that has a limited number of channels. This is where mobile devices can help and present patients with an alternative. If they want to listen to their favorite music and they have a phone or tablet with them but they didn’t bring headphones, the options are limited. This is especially true if there is another patient in the room. This is where have hospital headphones available for patients and visitors can play an important role in providing an additional level of comfort because of the number of different activities they can be used for. The good news is that some of the larger hospitals have already begun to keep disposable headphones on hand to give to patients and visitors that could use them. They can help make the visit less stressful and more relaxing because they can listen to music or watch their favorite videos on a mobile device. Many hospitals and medical facilities will setup a designated computer, laptop or mobile device that allows doctors, nurses and other staff members to complete the required training as time permits. This creates a situation where you don’t want the staff re-using the same headphones or earbuds. Everyone knows that it is vitally important it is to prevent the spread of germs in a hospital and headphones and earbuds are no exception. The easy solution is disposable headphones or recyclable headphones and disposable earbuds that are cost effective and available in large quantities at an affordable price point. A little extra comfort can go a long way in a hospital. 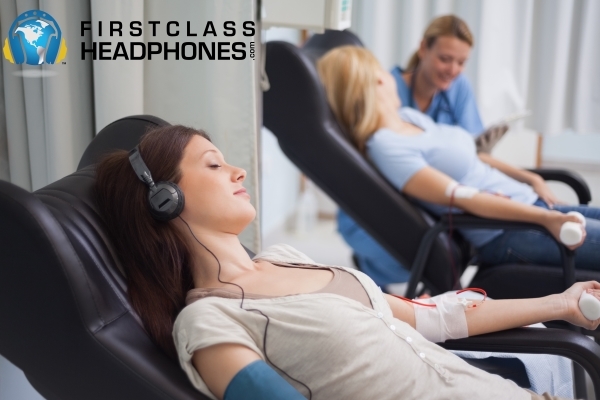 Whether you are looking for hospital headphones that go over the ear like traditional headphones, or earbuds that are individually packaged and take up a little less storage room, there are many helpful solutions available. Some hospitals stock disposable headphones for staff audio/video training sessions and carry disposable earbuds for patients/family. This allows them to track inventory separately and ensure there are specific solutions for different scenarios. We hope this information was helpful. If you are interested in more information, or If you are a healthcare professional that would like more information about equipping a hospital with headphones, please visit the First Class Headphones website FirstClassHeadphones.com You will discover a wide array of solutions for hospitals. We can even arrange to make trial pairs available for the hospital to test before making a large purchase. We offer fast shipping* on orders within the 48 continental United States on orders over $99 and we have several quality healthcare headphone solutions at great prices. Thanks for visiting our blog, please bookmark us and visit again soon. It uses Via Headphone Now technology and does not have a protruding microphone.